Leather Flip Cover with Built-In Smart Interactive Chip for Samsung Galaxy S5. The Smart and elegant, Promate Admin.S5 is a smart flip leather cover that replaces the back-cover of your Samsung Galaxy S5 offering optimum protection to your smartphone whilst looking elegant and stylish at the same time. 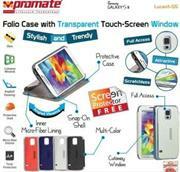 The specialized cut out window lets you do more without opening the cover. It offers a smart user experience such as answering or rejecting calls, checking missed events, camera control, controlling the music player etc. Live smarter with Admin.S5. 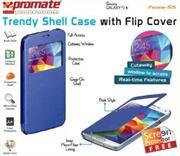 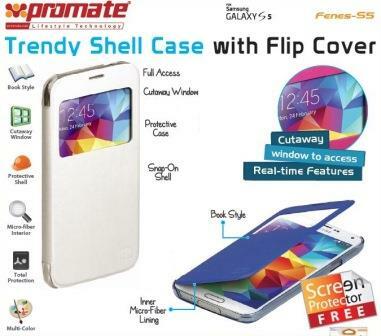 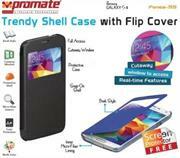 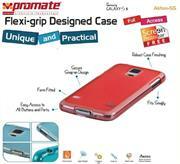 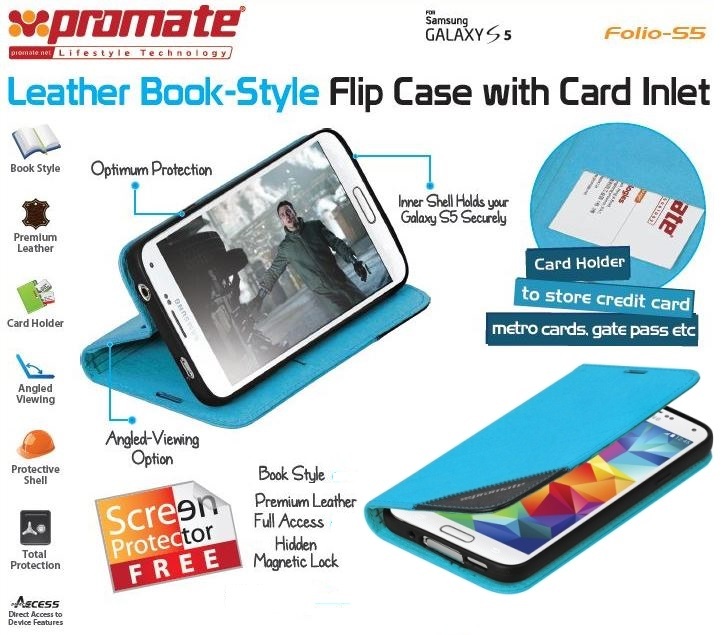 The Promate Fenes-S5 is an attractive book-style shell case for Samsung Galaxy S5. It is custom designed to fit your smartphone, providing full access to all the Samsung Galaxy S5 ports. With a clear see-through window opening at the front you can enjoy some of Samsung Galaxy S5 real time features and yet keep it protected. The inner microfiber lining provides optimum protection to your screen leaving it spotless and scratch-less. 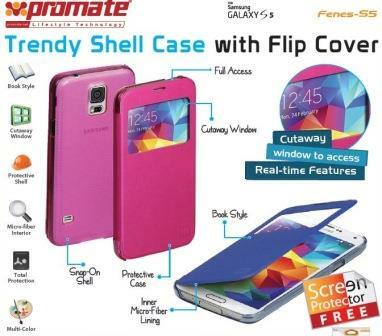 The Promate Fenes-S5 is designed to complement your style. 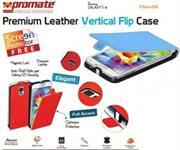 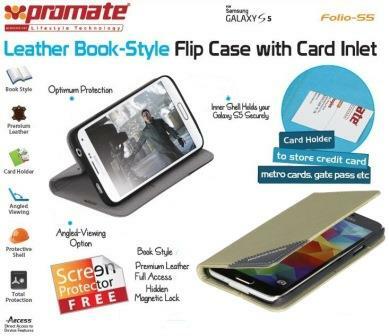 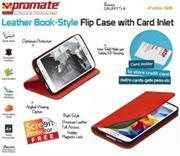 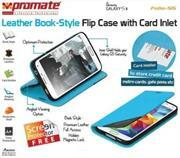 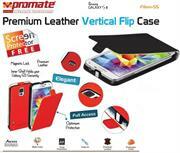 The Promate Folio-S5 is a leather flip case designed to provide optimum protection to your Samsung Galaxy S5. The front flap protects the screen when not in use and double up as a horizontal stand. The interior keeps your screen safe from scratches while the integrated case and secured closure ensure a streamlined fit. 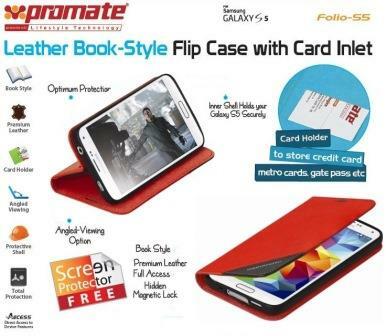 The case also features a card inlet to store your Id and other cards. 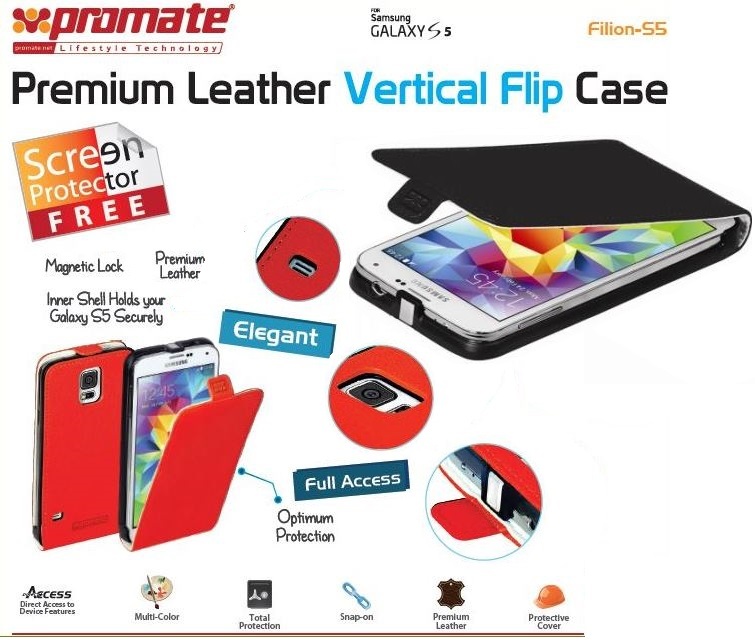 Folio-S5, is available in a range of colours that compliment your style. 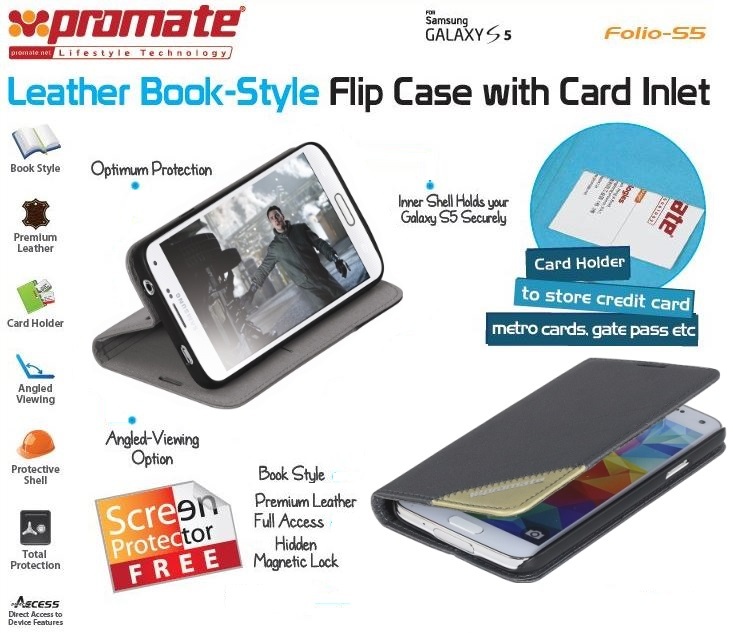 The Promate Zimba-S5 is a Premium Leather Wallet Folio Flip Case For Samsung Galaxy S5 , It lets you put all your essentials in one convenient grab-and-go package. This premium case features three card slots, and a vertical storage pocket on the left while gripping onto your smartphone on the right. The cleverly designed case can also double up as a stand for horizontal viewing of your smartphone. With specialized cut-outs for all your phone's ports and cameras, you never have to take your phone out of its comfy new home to charge or connect it. A magnetic leather fastening shuts case when the smartphone is not in use and provides overall protection for a long term operation and mobile usage which makes Zimba-S5 an optimum choice when it comes to smartphone protection. The Promate Lucent-S5 is an attractive book-style shell case with a transparent windows for an uninterrupted view of you Samsung Galaxy S5 screen. It is custom designed to fit your smartphone, providing full access to all the Samsung Galaxy S5 ports and buttons. With a clear see-through window opening at the front you can enjoy some of Samsung Galaxy S5 real time features and yet keep it protected. Lucent-S5 is designed to complement your style. 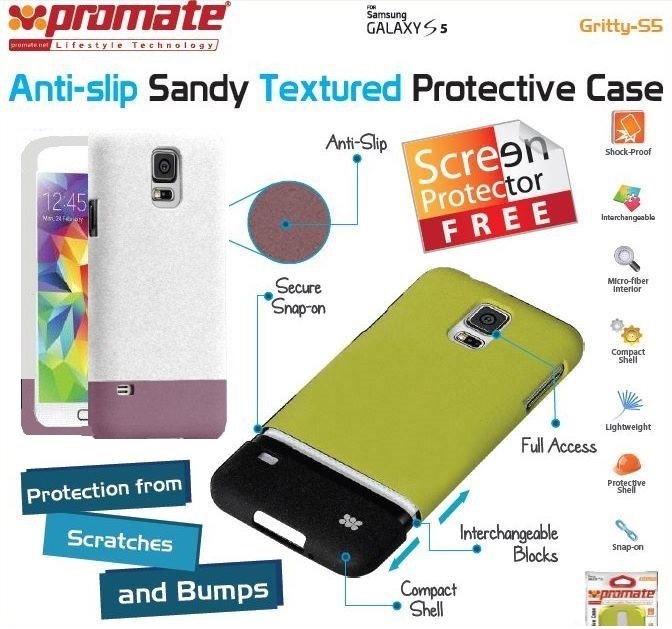 The Promate Gritty.S5 Anti-slip sandy textured protective case for Samsung Galaxy S5 is made of a high-quality anti-slip texturized polycarbonate plastic that provides long-lasting protection from accidental drops, scratches, abrasions and damage. 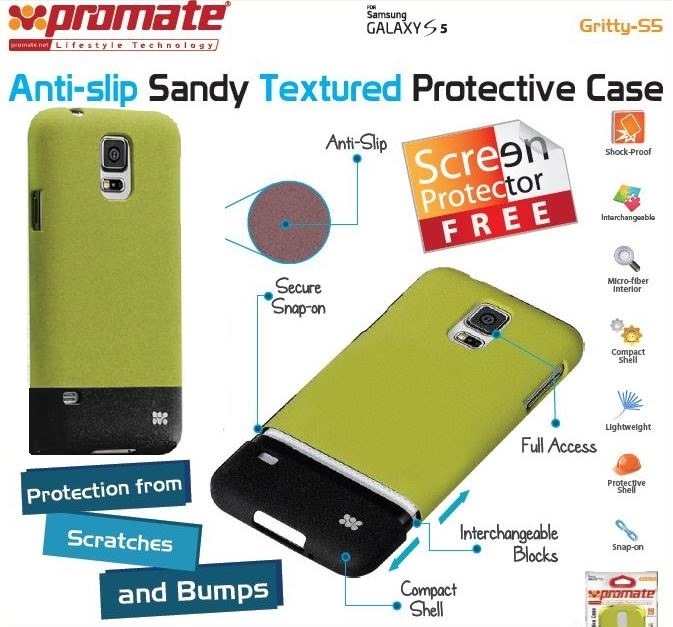 The micro-fibre interior provides soft, impact-absorbing protection, keeping your phone free from scratches and bumps. The Promate Crystal Clear Shell Protective Case For Samsung Galaxy S5 is made of pure, crystal-clear polycarbonate and finished with an anti-scratch UV coating, Crystal maintains a clear pristine view of your Samsung Galaxy S5 and at the same time offers optimum protection. 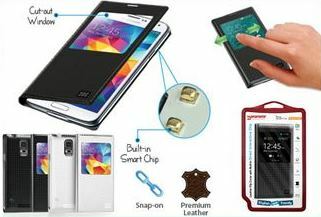 Crystal-S5 is precision cut to fit the contours of your smartphone and provide unrestricted access to your smartphone’s ports and buttons. 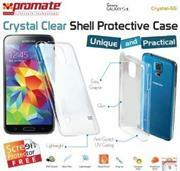 Let your smartphone shine with Crystal-S5. The Promate Akton-S5 flexi-grip designed case for Samsung Galaxy S5 is designed uniquely for both style and durability which incorporates the latest technology for strength and comfort. The case fits snugly on the Galaxy S5 whilst offering full protection from knocks and scrapes; it also ensures that you will have complete access to the phone’s external features. Akton-S5 doesn’t only offer a unique design; it is made to match your every style. 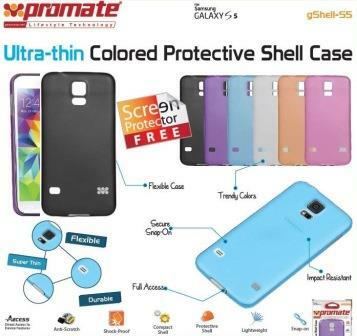 The Promate gShell-S5 is an extremely tough Snap-On protective shell for Samsung Galaxy S5. 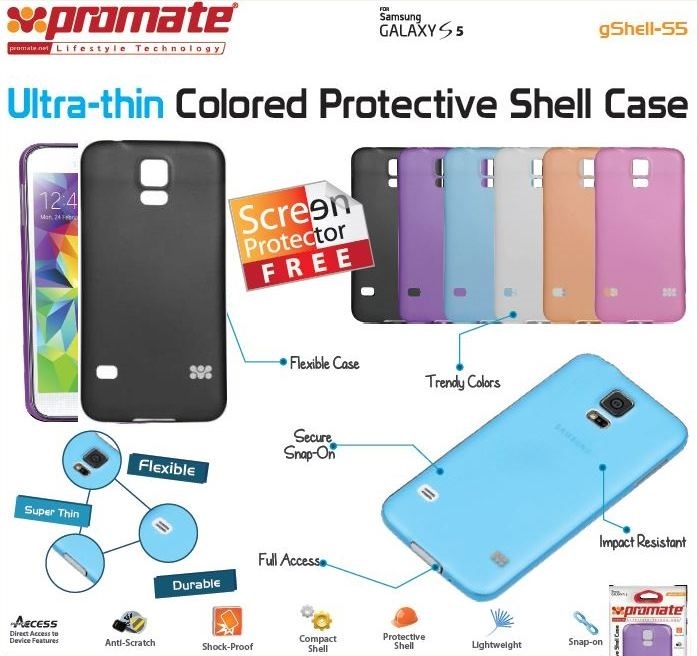 Made from high impact resistant polycarbonate plastic, gShell-S5 protects your phone from numerous knocks, scruffs and scratches; your smartphone is subjected to and yet provides complete and unfettered access to the smartphones main functions. 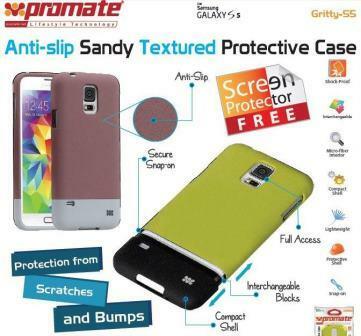 Lightweight, Portable and Unobtrusive, gShell-S5 ensures long term total protection for your Samsung Galaxy S5.